Aditya Birla Recruitment 2019 For Engineers| B.E/B.Tech| GMLP 2019|Freshers can Apply| No Fee - Sarkarinewjob.com A ultimate job portal to provide employment news. 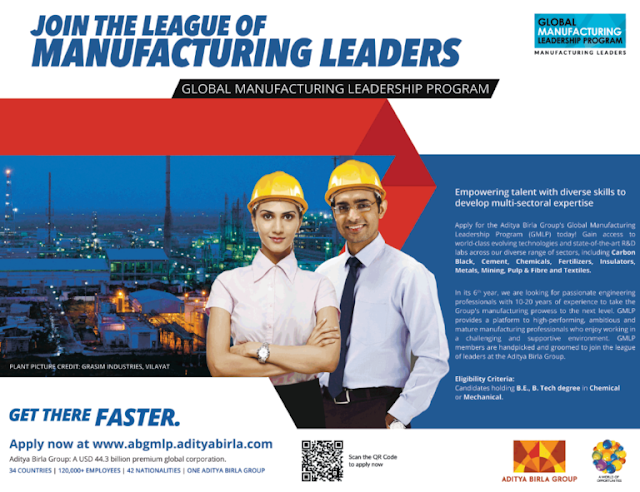 Aditya Birla Group Recruitment 2019 scheduled for Global Manufacturing Leadership Program (GMLP 2019) for Engineering graduates. The detailed eligibility criteria and application process are given below. Gain access to world-class evolving technologies and state-of-the-art R&D labs across our diverse range of sectors, including Carbon Black, Cement, Chemicals, Fertilizers, Insulators, Metals, Mining, Pulp & Fibre and Textiles. In its 6th year, we are looking for passionate engineering professionals with 10-20 years of experience to take the Group’s manufacturing prowess to the next level. GMLP provides a platform to high-performing, ambitious and mature manufacturing professionals who enjoy working In a challenging and supportive environment. GMLP members are handpicked and groomed to join the league of leaders at the Aditya Birla Group.